What do you know about e-cigarettes/vaping? Slide 3: What is an E-Cigarette? A battery-operated device that changes a liquid chemical (e-juice) into a vapour that can be inhaled. 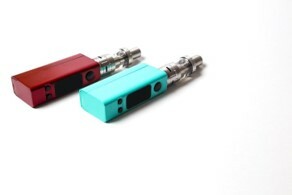 E-cigarettes are also known as e-cigs, e-hookahs, vapes, vape pens, mods and tank systems. E-juice = propylene glycol and/or glycerin, flavouring and often nicotine. E-cigarettes are rapidly changing products that have evolved since first entering the market in 2006. Advanced tank systems can produce more and hotter aerosol and may deliver nicotine more effectively and consistently than earlier generation e-cigarettes. They have removable, modifiable parts “mods” that allow users to change components of their device to alter the amount of aerosol produced. E-Hookahs: essentially the same as e-cigarettes, marketed with designs that reflect hookah culture. Heated Tobacco Products (“heat-not-burn”): heat tobacco to high temperatures using battery-powered heating systems that create aerosols (e.g., IQOS, Glo, Ploom, Pax). Cannabis Vaporizers: heat either leaf cannabis or cannabis oil to a temperature that creates aerosol. Not usually interchangeable with e-cigarettes, but some e-cigarettes can be modified to vape cannabis. Slide 7: Discussion: Why do youth vape? Slide 8: Why Do Youth Try E-cigarettes? In partnership with the UGDSB and WCDSB, WDGPH conducted student focus groups at all four WCDSB secondary schools and at four of the eleven UGDSB secondary schools. Focus groups were conducted in the spring of 2017 with over 680 students. The purpose of the focus groups was to gain a better understanding of students’ knowledge and perceptions of e-cigarettes to support the development of tailored curriculum resources. 77% of youth in grades 7-12 had never tried an e-cigarette. Use was higher among males and students in grades 10-12. 89% of students in grades 7-12 reported not using an e-cigarette in the past year. Use was higher among males and students in grades 11-12. 80% of grade 7 and 10 students reported not using an e-cigarette in the past 12 months. Grade 10 students were more likely to report use than grade 7 students. Even if people are not sick, they can still spread microorganisms (germs). If sharing e-cigarettes, keep in mind that many germs exist in saliva, and illnesses can be spread through direct exposure to saliva. It is recommended that e-cigarettes be cleaned with soap and water and sanitized with a bleach and water solution (½ teaspoon of bleach for every litre of water) for 45 seconds. Slide 11: Discussion: What are the negative health effects of vaping? Slide 12: What’s in E-Cigarette Vapour? Flavouring: chemicals like diacetyl which can damage the lungs when inhaled have been found in many sweet e-juice flavours (e.g., vanilla). Particles: sometimes at levels comparable to cigarette smoke. Can increase the risk of heart disease, lung cancer and asthma attacks and interfere with lung function. Metals: like lead, chromium, nickel, copper, aluminum and mercury. Exposure can have a variety of negative health effects including brain damage and cancer. Tobacco-specific nitrosamines: compounds found in cigarettes that cause cancer. Carbonyls: like formaldehyde which potentially cause cancer. 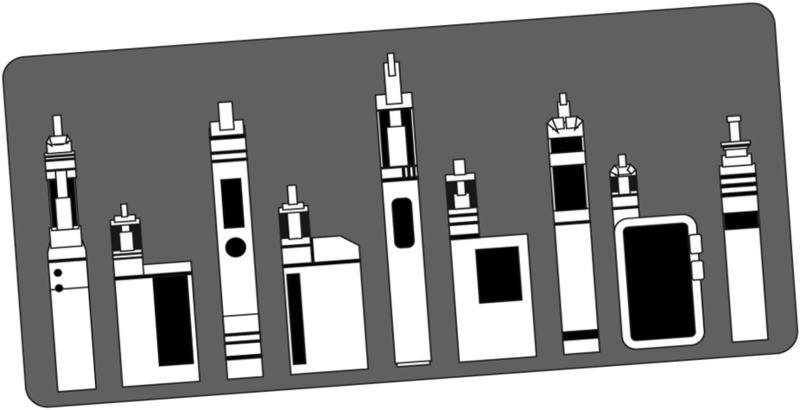 Overall, studies have found that different e-juices and devices produce aerosol that have different types and levels of toxic substances. There are no standards for determining safe levels of toxicants when inhaled into the lungs as vapour. E-cigarette vapour can cause light-headedness, eye and throat irritation, headaches, dizziness and coughing. E-cigarettes can cause injuries. Defective batteries have caused fires and explosions. Poisonings have been documented, with mostly minor toxic effects like vomiting and nausea. The effects of long-term, frequent exposure to e-cigarette vapour are not yet known. Slide 14: What About E-Juice with Nicotine? Nicotine exposure during adolescence causes long-term structural and functional changes in the brain. It can harm cognitive functions like working memory and attention span. Teenage brains are also much more sensitive to nicotine than adult brains and become addicted much faster. Slide 15: What About Second-Hand Exposure to Vapour? 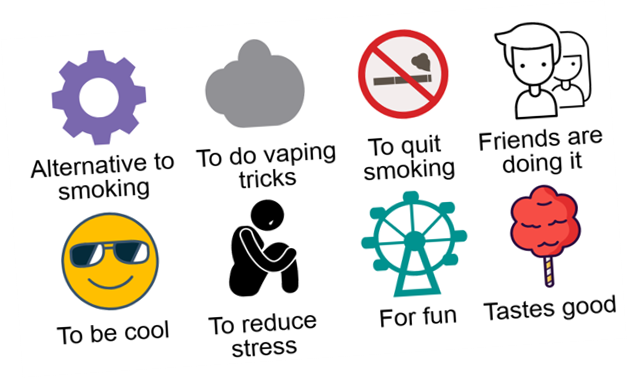 Second-hand vapour is less toxic than cigarette smoke, but more testing is needed to determine levels of exposure that may be dangerous for some people (e.g., children, people with asthma). Some ingredients in second-hand vapour can cause eye and throat irritation. Flavouring chemicals can create odours that irritate people who are sensitive to smells. Slide 16: Take Home Message. If You Don’t Smoke, Don’t Vape. There is enough evidence to suggest that anybody who does not smoke cigarettes should not vape e-cigarettes. Slide 17: What About Smokers? 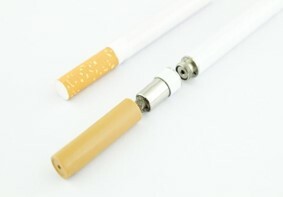 Most smokers who try e-cigarettes don’t quit smoking. They are more likely to co-use or to switch for a short time and then go back to smoking cigarettes. E-cigarettes are not proven to help people quit smoking. While evidence is still emerging, some research suggests that e-cigarette use is linked to improved rates of success when quitting. More research is needed to identify e-cigarette characteristics that deliver high enough nicotine levels to effectively help people quit smoking. Current research shows that youth who vape are more likely to start smoking cigarettes. But it is hard to know if youth who start smoking cigarettes after they try e-cigarettes would have started smoking if they had not used e-cigarettes. More research is needed. Is e-juice with nicotine legal in Canada? Is it legal to use e-cigarettes on school property? Is it legal to buy an e-cigarette if you are 18? On May 23, 2018, the Tobacco and Vaping Products Act (TVPA) took effect to regulate the manufacture, sale, labelling and promotion of tobacco and vaping products sold in Canada. On October 17, 2018, the Smoke-Free Ontario Act, 2017 (SFOA, 2017) took effect. Public areas within 20m from the perimeter of the grounds of primary and secondary schools. Under the SFOA, 2017, the sale and supply of e-cigarettes to anyone under 19 is prohibited. Ask students what they learned from the presentation. Testing Your Knowledge questions can be used to create a Kahoot! 2. Why do youth try e-cigarettes? 3. What’s in e-cigarette vapour? 4. What are the negative health effects of e-cigarettes? a) The long-term health effects of e-cigarettes are not yet known. a) The sale of e-juice with nicotine is now legal in Canada. b) The sale of e-cigarettes to anyone under 19 is prohibited. c) The use of an e-cigarette on school property is prohibited.